Phoebe is a name that relates to a goddess of the Greek pantheon, and whilst Phoebe might not be amongst the most famous of Greek goddesses, she does play an important role in linking the different generations of deities in Greek mythology. The most famous deities of Ancient Greece today are those associated with Mount Olympus, including Zeus and his wider family. Zeus though was but a member of the third generation of Greek deities coming after the Protogenoi and the Titans. Phoebe therefore predates Zeus for she was a member of the Titans. Phoebe was the daughter of Ouranos (Sky) and Gaia (Earth) two Protogenoi deities, the primordial gods of the Greek pantheon. Phoebe would have many siblings for there were 12 Titans in Greek mythology, thus Phoebe had six brothers (Cronus, Iapetus, Oceanus, Hyperion, Crius and Coeus) and five sisters (Rhea, Themis, Tethys, Theia and Mneomsyne). By the time of the birth of the Titans, Phoebe included, Gaia had already given birth to the three Cyclopes and three Hecatonchires by Ouranos. As well as these siblings, Phoebe would have many more half-brothers and sisters, for Gaia gave birth to many more offspring as well. At the time of Phoebe’s birth the cosmos was being ruled by Ouranos, but being insecure in his position, Ouranos had imprisoned his own children, the Cyclopes and Hecatonchires, in Tartarus, fearful that they might overthrow him. Ouranos though was less worried about the power and strength of the Titans though, and so they roamed freely through the universe. The imprisonment of her children greatly hurt Gaia, both physically and emotionally, and so Gaia would plot with the Titans to overthrow their father. Thus, when Ouranos next descended from the heavens to mate with Gaia, the male Titans held their father down, and then Cronus castrated him with an adamantine sickle. Phoebe, and the other female Titans, did not play a part in the rebellion of the Titans, but Phoebe would benefit from the results. Ouranos would retreat back to the heavens, but he had lost most of his powers, and so Cronos took up the position of supreme god of the Greek pantheon. The universe was then effectively divided between the Titans, with the various elements becoming connected with an individual. Thus, Phoebe was closely associated with the moon and prophecy. Phoebe would become closely associated with the Oracle at Delphi because of her role as the goddess of prophecy, although preceding her as goddess of the Delphic Oracle were Gaia and Themis. During the Golden Age of Greek mythology, Phoebe, and indeed the whole cosmos prospered, and it was during this time that Phoebe would be married to the Titan Coeus, a relationship which brought forth two famous daughters, Leto and Asteria, and a less famous son, Lelantos. Via these children, Phoebe would also be grandmother to Apollo and Artemis from the relationship between Leto and Zeus, and Hecate, from the relationship between Asteria and Perses. The Age of the Titans would come to an end, just as the rule of Ouranos and the Protogenoi had, for Cronus’ son, Zeus would lead a rebellion against his father, a rebellion that led to a 10 year war, the Titanomachy. Few details of the Titanomachy are to be found in surviving sources, but it was known that the majority of the male Titans fought from Mount Othrys, whilst Zeus and his allies were to be found upon Mount Olympus. Phoebe and the other female Titans though, were not active in the fighting, although it is to be believed that they were sympathetic to the war being fought by her husband and brothers. The rise of the gods of Mount Olympus was of course assured with victory in the Titanomachy, and of course Zeus would take up the position of supreme deity from his father. Those who had fought against Zeus were punished in various form, with most of the male Titans imprisoned for eternity in Tartarus. Phoebe, having not played an active role in the war, went without punishment, and was allowed to remain free. Phoebe’s status though was now greatly reduced, for her spheres of influence were distributed amongst other deities. 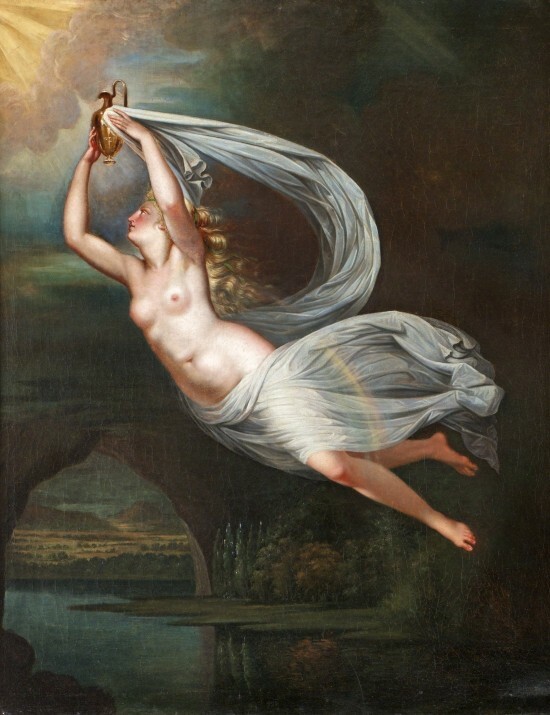 Selene would become the primary Greek goddess associated with the moon, whilst her own grandson, Apollo, would be the Olympian god most closely associated with prophecy. A Greek mythological tale has the symbolic passing of power from Phoebe to her grandson, for it was said that Phoebe gave Apollo ownership of the Oracle at Delphi upon his birthday. With the passing of power, the name of Phoebe all but disappears from the story of Ancient Greece.